The Ultimate Style Guide to writing job descriptions. Writing job descriptions that attract top talent isn’t easy — but it doesn’t have to be hard. 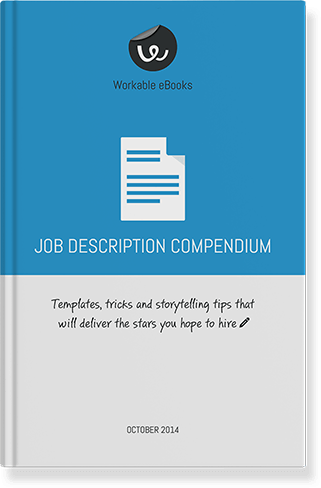 Get a head start with our Job Description Compendium ebook. Featuring more than 180 well-crafted job description templates (each adaptable to your unique job and organization), and full of tips and tricks proven to stop eyeballs and start applications, it has everything you need to master the job description. Download this ebook now to start writing job descriptions that attract top talent. Download the guide, read it, enjoy it and share it. Workable is flexible, global, easy-to-use hiring software. Available on desktop and mobile, and with 24/7 support worldwide, it’s the modern way to hire. Eleni Kourmentza is a former head of Workable People Operations or as her colleagues call her the ‘happiness manager’. Apart from from drafting CVs for almost everyone she meets, she enjoys long walks and talks.